Half-round gutters just look great. If you’re shopping around for the perfect look for the gutter system of your home, we’re here to say that half-rounds may be the way to go. Let’s take a look at half-round gutters, and why they’re such an excellent option. Half-round gutters are just as they sound—half round. These gutters feature a pleasing half-circle design along the length of the gutter. While traditional gutters have corners, half-rounds are smooth and uniquely appealing. Half-round gutters simply look great, and they function about as well as any other gutter type. While half-round gutters are a bit more expensive than standard, “K-style” gutters (those flat gutters that you’ll find on most homes), half-round gutters add to the appeal of your home, and they increase your home’s value. Half-round gutters are especially popular in conjunction with slate roofs, tile roofs, and wood shake roofing. In addition to their aesthetic, half-round gutters are less prone to damage caused by corrosion than other gutters. Since half-round gutters don’t have corners (which are more prone to cracking and corrosion), they can outlast other gutter types. In addition, once again due to their smoother design, half-round gutters stay more debris free, since they can move much of the debris that falls into the gutter system away from the gutters and down the downspout. For their better appearance, value, and functionality, half-round gutters are an excellent choice for homeowners who are renovating their rooflines. L & J Gutters is your Top Rated Local® gutter contractor team, and we provide service for folks throughout Walton, Okaloosa, and Bay Counties. 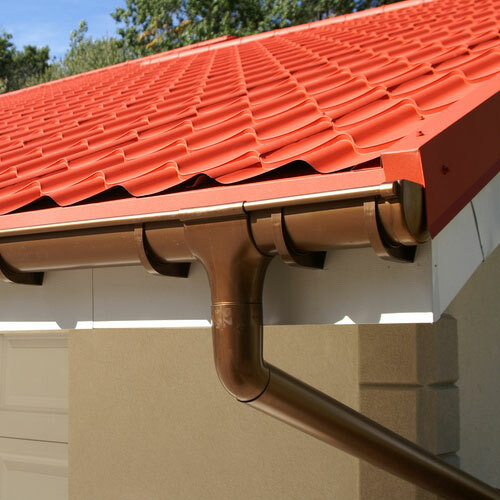 We’re proud to custom build gutter systems of all varieties, including half-round gutters, aluminum gutters, copper gutters, rain chain gutters, and of course, seamless gutters. If you’re ready to get started, don’t hesitate to get an estimate for your project, or, if you prefer, you can learn more about our gutter services.